Have you ever wondered if there is a way to determine whether your newly strung racket is at the right tension that you asked for? Perhaps you’re trying out a different stringer, or you’re stringing yourself and you’re not sure whether the string job is consistent. Or perhaps you’re wondering why after playing a few weeks your strings don’t feel as crisp as it did initially, and you just want to monitor the inevitable tension drop so that you’ll know to string a bit higher next time. Or whether the 30 lb that your friend says he plays with is really that when it feels less tight than the 25 lb that you play with. Or perhaps you just want to monitor more precisely and objectively your preferred tension than just by pushing the stringbed with your fingers or pinging the strings to the ear. Fortunately with the ubiquitous existence of smartphones, there is an easy way to achieve this by using a smartphone app to measure the fundamental or dominant frequency of the stringbed. For tennis, an app exists that measures the frequency, and given information on string diameter and racket face area, it will calculate the string tension. This however doesn’t work as well for the lower tensions used in badminton. 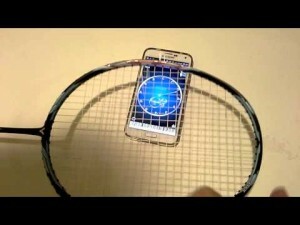 For badminton, there are several tuner apps for smartphones that can be used to measure stringbed frequency, eg. CarlTune for Android, and ClearTune for iOS. It’s quite easy; just flick or strum lightly across the stringbed with your 3rd and 4th fingers like a guitar, and let it ring close to the mic on your smartphone preferably in a quiet room. As in this video. 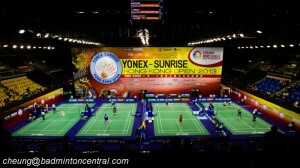 I had initially started a thread to pool data points for various strings at different tensions here (http://www.badmintoncentral.com/foru…string-tension). Kwun and other stringers had kindly contributed tables and tables of data points and soon we could see the difference between thick and thin strings. Interestingly, Kwun’s measurement of a single piece of ZM62 string under various tensions correlated directly to my measurements of a ZM62 stringbed after a few weeks of play. Higher initial tensions will lose more, and certain strings (eg. BG65, VS850) that are well known for their tension loss will also lose more if not properly prestretched. Other factors that mitigate tension loss include mostly stringing techniques such as ECP (electronic constant pull) machines, slower and longer pulls, sturdy clamps and side supports, 2 knots 1 piece stringing (possibly) vs 4 knots 2 pieces, special finishing knots etc. Accepting these sources of tension loss then, the real tension that we play with is dependent on the time it has been since strung and the time it has been played with. So a requested 27 lb job will drop to an actual 25-26 lbs 1 day after stringing without play and then continue dropping to 23-24 lbs after 10-20 hrs of play. Maybe that’s why pro players need to restring their rackets every week! In any case, the most important thing is that we all like to play with a certain consistent tension, hence this objective method of monitoring string tension. #1) How string frequency is related to tension, string length and density.